Kerry County Museum has something for every age and interest, and our attentive and professional staff will help you plan a memorable experience. We welcome groups of all shapes and sizes, and we will provide you with an experience your group will never forget. Whether you are planning to visit for just an hour or have all day, we’ll make it easy for you to customize your trip. Visits to the Museum are usually self-guided but with advance notice we can provide a guided tour for groups of ten or more. Inquire about which area you are interested in when you are making your reservation. 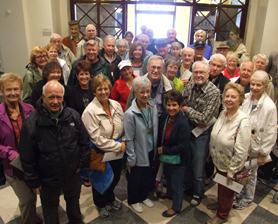 A group from the United States on tour with Grand Circle Travel enjoying their visit to KCM.